United Arab Emirates, Somali Times. Elderly clans Business people against, the Bosaso port agreement. 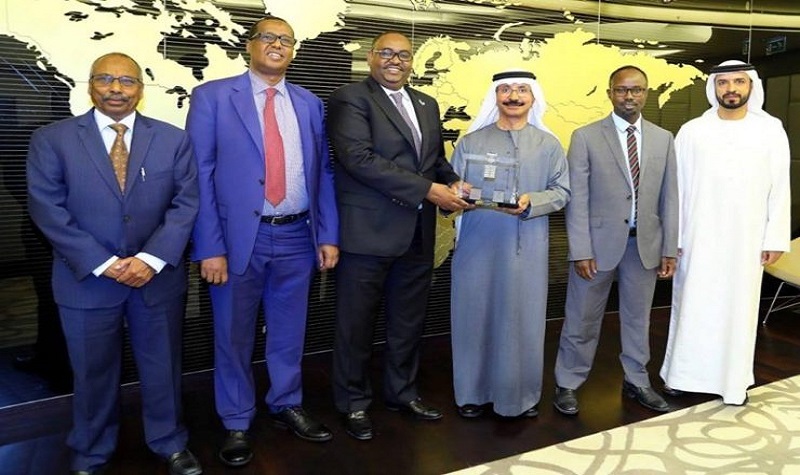 Somalia government Ban DP-World to operate in Somalia even parliament they vote against DP-World, The Governor of the Puntland State of Somalia Mr Said Abdullahi Deni met with the Chairman of DP-World, led by Sultan Ahmed bin Sulayem. The Governor was accompanied by the Minister of Ports and Marine Transport Mr Mohamed Abdi Osman, Minister of Commerce, Industry and Investment Abdullahi Abdi Hersi, Minister of Civil Aviation and the Ministry of and Hussein Osman and officials from the Puntland State administration. The meeting was addressed by building and expanding the port of Bosaso, the absorption of such an add-in port and the success of the Convention on the youth clubs compared to the project necessary. Governor Deni receives $ 5 Million us Dollar to carry on the Bosaso port agreement is committed to the development of the Puntland administration’s infrastructure and investing in investment issues pledged that the new Puntland administration will create a framework that will enable Puntland to invest in the international community, supporting the security and development of Puntland. DP-World has pledged to speed up the construction and expansion of Bosaso port and to keep track of the agreements and all-inclusive projects for the promotion of business, political, economic and cultural ties. Puntland and the United Arab Emirates. What is the benefit of DP World? Djibouti officials claim the concession agreement contravenes state sovereignty and national interests and makes DP World the key authority in a Geo-strategic corridor. Even though Djibouti held the majority of the equity in the pot, DP World, they say, held a majority of the voting rights on the board of directors. Bin Sulayem added that it was a worrying development for capital, making its way to the African continent. “I can tell you it is putting a shadow on investment in Africa and it is making such investment more expensive. We continue to invest, but I’m sure others are looking at this as an example,” he said. Somali President chairs a conference on the constitutional review process.